If you stand on the banks of the river Narva in North-Eastern Europe, you can see two medieval castles facing each other on both sides of the river. These castles are a powerful symbol of the border between Russia and Estonia, a border that, in our times, also separates the European Union and NATO from Russia. The question is: Is it also the fault line between two distinctive civilizations (Western and Orthodox)? According to Huntington in his 1993 article ‘The Clash of Civilizations?’, the great division among humankind in the new phase will be cultural, the ‘clash of civilizations’ will dominate global politics. The fault lines between civilizations will be the battle lines of the future. Has this new phase arrived? This article will argue that the Estonia/Russia border is indeed a fault line between the Western and Russian civilizations, and it leads to simmering conflict. This conflict also exists inside the Estonian society, as a large minority of Russian speakers reside in Estonia. To the East of Narva, the vast plains stretching through the Ural Mountains to the coasts of the Pacific Ocean form the territory of the Russian state. Samuel Huntington cites Carroll Quigley in distinguishing the Orthodox (Russian) civilization as emerging from the Classical (Mediterranean) one, but taking on a separate path later (Huntington 1996, 49). Huntington considers Russia creating a bloc with an Orthodox heartland. At the same time, according to Huntington, Russia is a torn country with its identity in permanent crisis (Huntington 1996, 164). It is important to note here that the Russian identity has always been defined in opposition to the ‘significant other’, and this other has always been the West. The West was either positive or negative, but it is always present in the visions of national identity and national interest (Tsygankov 2006, 17). There were several attempts to modernize Russia during the course of history. One famous attempt of modernization and Europeanization was undertaken by Peter the Great in the eighteenth century. Later on, in the nineteenth century, the debate between Slavophiles and Westerners dominated the intellectual debate in Russia. Relevant for our times is the experiment with democracy of the 1990s, when the authorities of Russia undertook radical reforms at home, and took a pro-Western course in foreign policy. The opinion leaders and policymakers of Russia could be divided according to their foreign policy attitudes into Westernizers, Statists and Civilizationists. Westernizers placed the emphasis on Russia’s similarities with the West, the importance of liberal values such as human rights, democracy and free market. Statists, in contrast, chose the values of stability, power and sovereignty over freedom and democracy. The statist main purpose though was pragmatic, defending the Russian national interest by geopolitical means. Civilizationists, on the other hand, saw Russian values as distinct from the West, and they wanted to spread these values around the world. Their response to the issues of the security of Russia was more aggressive than the Statists’. Statists basically think of defending the status quo and play the geopolitical game, they are not against negotiations with others. For Civilizationists, the Russian civilization is seen as superior, and this approach is connected to the ‘Third Rome’ dictum, and the ‘gathering of Russian lands’ (Tsygankov 2006, 7). The Russian people, as different from many other peoples has been formed as a carrier of unique civilization, which has all the distinct features of original and full planetary-historic phenomenon. The Russian people is the constant, which served as an axis for creation of not one, but many states: from the mosaic of the dukedoms of Eastern Slavs, Moscovite Rus, the Empire of Peter the Great and the Soviet bloc. (…) The Russian people did not just provide for the ethnic base for all of these state formations, but it expressed a special civilizational idea, unlike any other. It is not the state that formed the nation. The other way around, the Russian people, the Russian nation has been experimenting in history with different types of state systems, expressing in a different way (depending on circumstances) the specificity of its unique mission. The Russian people certainly belong to the messianic peoples. As any messianic people, it has universal all-human meaning, which competes not just with other national ideas, but other forms of civilizational universalism (Dugin 1997, 191). … a compatriot is not a purely legal category. And even further – it is not a question of status or any advantages. This is, first and foremost, the question of personal choice. The question of self-determination. I would even say more precisely – of spiritual choice. This way is not always easy (Putin 2001). Similar statements appeared in the media at the time from other officials. In 2001, Vladimir Putin signed the new document ‘The concept of supporting by the Russian Federation of the compatriots abroad at the present stage’, in which the notion of a ‘compatriot’ is even blurrier. ‘Persons permanently living outside of Russian Federation, but connected to Russia by historic, ethnic, cultural, language and spiritual links, who strive to preserve their Russian originality (самобытность) and willing to keep contacts and cooperate with Russia’ (Самородний 2014, 71). We can see the tendency from trying to embrace compatriots into the legal framework of the Russian Federation towards leaving this concept quite blurred. The manifestation of the Russianness is becoming a more emotional concept with the emergence of the so-called ‘Russian World’. The term ‘Russian World’ was used in medieval accounts to define ancient Rus. It can be traced to the 11th century in the writings of Russian Grand Prince of Kiev Iziaslav Iaroslavich, who spoke of a ‘Kherson and Russian World’ in a letter addressed to the Roman Pope Clement (Laruelle 2012). The term seems to have been taken from his account in the nineteenth century by Count Sergey Uvarov (1786–1855), president of the Imperial Academy of Sciences and minister of education, famous for having crafted the tripartite emblem of the reign of Czar Nicholas I: ‘Autocracy, Orthodoxy, Nationality’. However, the term was not commonly used, and preference was given to other concepts. The founding father of Slavophilism, Aleksei Khomyakov (1804–1860), spoke of the ‘Russian spirit’ (русский дух), the Silver Age philosophers Vladimir Soloviev and Nikolay Berdiaev of the ‘Russian idea’ (русская идея), and it is as common in Russia as in the West to encounter the idea of the ‘Russian soul’ (русская душа) when assuming that Russia is eternally miscomprehended. Over the course of the twentieth century, following tectonic historical shifts, world wars and revolutions, a Russian World was created on Earth – a network of small and large communities, thinking and speaking in Russian. It is not a secret that the territory of the Russian Federation contains only half of this Russian World. 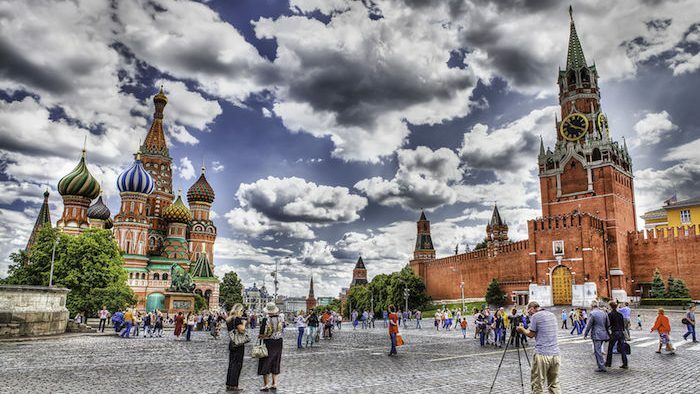 The state formation created on the territory of the Russian Federation at the turn of the 1990s did not turn out to be an adequate means for incorporating Russian society into the global historical process. (…) This process of social degradation (the collapse of the Soviet Union) has been compensated by the formation, over the course of the twentieth century, of a sizeable Russian diaspora in the world (Островский 1999). In conclusion, the article highlights the innovative character of the Russian World as a sign of a new, globalized Russia: ‘A Russian World in a Peaceful World (русский мир в мире миров), attracting Russians from all over the world to participate in a new global meta-project’ (Laruelle 2015). The Russian World is characterized by a dual aspect: it is a brand for establishing Russia’s voice in the chorus of nations, but it is also a vessel for a more philosophical or religious messianism, with the notion that Russia’s message to the world has a universal value of salvation (Laruelle 2015). It is also important to note that in Russian, the term «мир» has not only one meaning (‘world’), but also the meaning of community, village community first of all, of ‘everybody’ in a sense. It also has a third meaning – peace. The role of the Orthodox Church in Russia cannot be underestimated. It can be well explained by Huntington’s claim of the revival of religion in the world of the ‘clash of civilizations’. He specifically mentions Russia, where Orthodoxy had gone through a major resurgence (Huntington 1996, 96). It can be easily claimed that the recent revival of civilizational rhetoric is purely instrumental, and done with geopolitical purposes in mind. I claim that the thesis of Huntington is more relevant to explain the moves of Russian authorities. It is a conflict of different cultures and even emotions that drives Russia away from the West and into elaborating its own peculiar civilization. We could see now into the formation of attitudes in Russia, in what concerns the Russians abroad. What about the Western bank of Narva? The region of the Baltics has been populated for a long time, more than 6000 years since the end of the Stone Age. People known as Estonians or Aesti have been living here for around 1500 years (Raun 2001, 3). The origins of Finno-Ugric tribes are obscure. The first major theory by the Finnish scholar M.A. Castren in the nineteenth century postulated that a common homeland for the Uralic and Altaic peoples was in the Altaic mountains of South-Eastern Siberia (Raun 2001, 6). Later, the ideas which denied the common origin of all these peoples emerged. By the present day, these peoples preserved their languages, which are not part of the Indo-European group. Later on, in the 13th century, these pagan tribes fought the Livonian Order and were finally occupied by them. It has been the beginning of the settlement of the German-speaking landed gentry on these territories. The first encounters with the Slavs took place early on, especially well-known is the conquest of the settlement of Tarbatu (present day Tartu) by the Prince Yaroslav in 1030 (Miljan 2015, XXV). The Livonian Order had some designs on the Slav lands to the East, and there were several armed conflicts. After many devastating wars, and especially the Nordic Seven Years War (1563–1570), Estonia, at the time known as Livonia, fell under Swedish rule. This period is still sometimes referred to colloquially as ‘good old Swedish time’ (Kõiv 2000). What later came to be called the ‘Northern War’ broke out in the region in 1707. It was connected to the tsar of Russia, Peter the Great’s policies of expanding to the West, and needing the ‘window to Europe’, as St. Petersburg was referred to (Ponsard 2007, 11). After 1721, Estonian territory became part of the Russian Empire and it remained this way until 1918. It is important to remember that by this time, Estonians were Protestants, and this led to the high level of literacy in their mother tongue, as everybody had to listen to the sermons in their native language and also know how to read the Catechesis. Thus, Estonian language education was spreading, and with time, the number of educated Estonians reached critical mass, which served as a basis for reconstruction of historic memory and emergence of independent thinking (Laidre 2001, 85). It can also be claimed that according to the famous thesis of Max Weber, Protestantism led to the high morals and work ethics among the population. Max Weber notes that the German word for profession is Beruf or ‘calling’, the same is true about the Estonian language – elukutse is ‘calling’ or, more precisely, ‘life calling’. Thus, Protestantism claimed that you can achieve unity with God through your work, through your profession. Huntington also claims that there is a correlation between democracy and Protestantism, with many and first Protestant states becoming democracies (Huntington 1991, 37). Protestantism has great influence on the values of Estonians still, and these values sometimes clash with the Orthodox ideas of ethnic Russians. With the reign of Peter the Great, not much changed in the constitution of society: German aristocracy kept their privileges, the German language was used in administration, and Peter the Great actually called the new provinces his ‘German provinces’ (Faure and Mensing 2012, 119). Few Russian aristocrats owned the land in these territories. This arrangement was called ‘Baltic special order’ in the Russian Empire. It must be noted that the Russian Empire did not see the necessity of forceful assimilation of the newly acquired lands and was rather tolerant towards different confessions. Its way of ruling was by using local aristocracy, and the German barons were also serving the Empire in the capital. The Estonian people remained maarahvas or ‘countryside folks’ not having many opportunities for social mobility and being mainly peasants. For these people, both German aristocracy and Russians masters were ‘others’, and this is how the Estonian identity was formed. In the nineteenth century, the national awakening was taking place among Estonians echoing the overall European process of nationalist ideas. The Estonian model has its roots in the ideas of Johann Gottfried von Herder. For Herder, nationalism was more a cultural phenomenon than a political one (Schmidt 1956). As there was no state of Estonians, the emphasis on ethnicity mattered more. Thus, it has deep roots, which help us understand modern processes better. It was also during this time when under the rule of the Russian tsar Alexander the Third, the policy of ‘russification’ started. By 1918, the opportunity presented itself, after the devastating First World War, Bolshevist Revolution, and the Brest-Litovsk settlement. The Estonian Republic was proclaimed, followed by the War of Independence against Soviet Russia and Landeswehr, the forces of Baltic German aristocracy. The Estonian Republic existed until the 1940 occupation by the Soviet Union, which happened as a direct result of the Molotov-Ribbentrop Pact of 1939, and its secret protocol dividing this part of Europe into spheres of influence. The German occupation followed in 1941, and then Soviet occupation again in 1944, which lasted until 1991. Soviet authorities applied cruel policies of repression against the Estonian population including mass arrests and deportations to Siberia. After the Second World War, massive migration was conducted to the territory of Estonia, and a 1989 Soviet census established that about 30% of the population of the Estonian Soviet Socialist Republic were non-Estonians. They mainly came to work for the industries, and mostly they did not master the Estonian language (around 15% of newcomers spoke Estonian) (Rudensky 1994, 63). Another wave of ‘russification’ followed, when Russian became the language of communication in many spheres. As Perestroika started in the 1980s, there were the language issues, which were high on the agenda in Estonia, as the situation with the Estonian language was the most important problem next to the demand for autonomy (Rannut 2004, 5). The language law was adopted by the Supreme Soviet of Estonian SSR in 1989. The process of transformation is closely connected to the Singing revolution of civic disaccord with the Soviet rule starting around 1987, protests against new projects of Soviet rule, such as the phosphorite excavation. There was an extraordinary show of solidarity in 1989 of the Baltic republics known as the Baltic chain, when about two million people from Tallinn to Vilnius joined hands to remind the world of the Molotov-Ribbentrop pact. Notwithstanding attempts at russification, the Estonian identity was preserved as strong all through the years of all the occupations and mistreatment. Estonian identity developed in close connection with Western civilization, and naturally, after the declaration of independence in 1991, the main goal of the government was its reintegration with the West. The foreign policy of Estonia was flowing naturally from its source – the need to re-establish a nation-state based on the national identity of the majority ethnic group. The first goal was to ensure that the independence was for real, and thus, the Russian troops withdrawal was a must (Kauppila 1994). It took years of painful negotiations until 1994 when the last Russian soldier left Estonian soil. The border negotiations were conducted simultaneously, and this story is not yet finished, as the Russian Duma has not ratified the border agreements at the time of writing of this article. Estonia opted for a crash course in reforms and, as a result, enormous progress has been made since 1991: national and municipal elections have been completely free and open, the Estonian press is free and independent and there are thriving non-governmental organizations in every sphere of public life (Ilves 1998). Estonia was left with the legacy of about 27% of non-Estonians residing on the Estonian territory. The first reaction of Estonians was to ignore and neglect this issue – maybe the Russians would all move back ‘home’? There were plans of repatriation and strict citizenship and language polices were adopted. The main principle of the policies was that of restitution – meaning that the Estonian Republic was the legal descendant of the pre-war Republic, and not a new state. This is a crucial principle in order to understand everything else going on in the society. Citizenship was granted to everybody whose ancestors were residing in the pre-war republic, notwithstanding their ethnicity. All the people who came later had to pass the process of naturalization – meaning pass an Estonian language exam and demonstrate knowledge of the Constitution and citizenship legislation. It led to the situation where about one third of the minority population have no citizenship and are considered aliens. At the same time, it also enabled pro-Western policies, as there was no opposition in the Parliament to the course of reintegration with the West. By mid-1990s, Estonians realized that the Russians were a part of society, and they would not be leaving. It had been the start of the so-called integration policy. This is the policy of the inclusion into the society, though it first primarily concentrated on the need for non-Estonians to improve their command of the Estonian language. The general idea of the integration policy is to replace the attitude of ‘non-Estonians as a problem’ with the attitude ‘non-Estonians as development potential’. The direction towards integration took place under the influence of three factors: the results of the academic research, the changing of political values, and the pressure from international organizations (Kallas, Mihkelsoo and Plaan 2012, 9). In order to map the tendencies in integration, the Integration Monitorings are undertaken every now and then, the most recent results are of 2015 and 2017. The Monitoring of 2017 showed that command of the Estonian language among non-Estonians is improving, and the majority of the population supports starting with Estonian language instruction in kindergarten. The results show though that the majority of both Estonians and non-Estonians communicate in their own language space (Kaldur et al. 2017, 99). The results of various research also shows that it is not only the command of the Estonian language that divides the society, but the attitudes towards many issues are different for the two communities. In nowadays society, the difference of values is manifested in many ways, such as family patterns, attitudes towards LGBTI, the role of religion in life, state policies – in general, one can claim that Russians are more conservative in relation to these issues. The attitudes towards LGBTI were thoroughly researched in 2014, and the data showed clear differences according to the major communication language of the respondents. Forty-nine percent of the Estonian-language respondents accepted homosexuality, with this number being just 21% for the Russian-speakers. Forty-four percent of Estonians and 73% of Russian-speakers did not accept homosexuality (Turu-uuringute AS 2017). Attitudes towards religion were researched in 2015 and the results showed that 19% of Estonians and 25% of non-Estonians belong to a congregation with 46% of Estonians and 80% of non-Estonians having been baptized. Forty percent of the overall population considers itself Orthodox, and 36% considers itself Lutheran (Saarpoll OÜ 2015). The main clash in opinions, though, is going along the lines of the attitudes towards Russia and its policies, with the majority of Estonians seeing its assertive behavior as a threat, and the Russians seeing the need for better relations with the Russian state. Thus, 79% of Estonians consider NATO membership to be a security guarantee, while only 28% of Russian-speakers do. At the same time, 67% of Russian-speakers consider cooperation and good relations with Russia a security guarantee, and this number is only 13% for Estonians (Kivirähk 2015, 20). The recent study of the Estonian society ‘Estonian society in the accelerating times. The results of the survey “Me. World. Media.” 2002–2014’ analyzed, among other things, the ethnic identities of Estonia’s residents. One of the conclusions is that ethnic belonging is becoming dominant in comparison with other political identities – it is becoming the central identity a person applies to their self. Ethnic identity, both for majority and minority groups, is based not on political, but on cultural-religious symbols, values and practices, as one’s ethnic belonging is perceived as the opposite of territorial or political solidarity. The Estonian Russian population has developed a strong identity based on ethno-cultural and religious roots expressing ethnic opposition and spiritual solidarity. It has happened, according to the research results, as a reaction to societal developments which are considered negative by the minority (Vihalemm et al. 2017, 134). Now we are coming towards the interaction between these two states and societies, which we see are quite diverse. We could see the differences in culture and attitudes that support Huntington’s thesis of an Orthodox civilization as distinct from the West. Estonia belongs to the West with its history, culture and values. Russian Orthodox civilization influences the attitudes of Russians in Estonia a great deal. As Huntington also puts it, Russia has a ‘kin-state syndrome’ towards Russians outside Russia (Huntington 1996, 272). We can see that the present Russian state’s orientation on civilizational discourse leads to the situation that many Russians abroad can identify themselves with Russia without taking any everyday practical decisions, such as repatriation. The Russians in Estonia live their everyday life in the European Union. At the same time, they preserve their emotional link to Russia. This phenomenon could be described as transnationalism, as the transnational audience preserves the double reference framework, as they constantly compare their situation to that of their kin-state (Vihalemm et al. 2017, 598). In a way, Russians outside Russia become ‘more Catholic than the Pope’, because they see the reality of their countries of residence and compare it with the virtual reality created by the Russian state media. We could see that the ‘clash of civilizations’ is happening both between the states of Estonia and Russia, and at the same time in the minds of the Estonian population, as the Russian minority is influenced by the Orthodox civilization. Дугин, Александр. 1997. Основы геополитики. Геополитическое будущее России. [The Foundations of Geopolitics. Geopolitical Future of Russia.] Арктогея, Москва [in Russian]. Самородний, Олег. 2014. Соотечественники Кремля. [The Compatriots of Kremlin]. Kärdla [in Russian]. Faure, Gunter and Teresa M. Mensing. 2012. The Estonians; The Long Road to Independence. Gunter Faure and Teresa M. Mensing. Huntington, Samuel P. 1991. The Third Wave: Democratization in the Late Twentieth Century. University of Oklahoma Press: Norman and London. Huntington, Samuel P. 1996. The Clash of Civilizations and the Remaking of World Order. Simon and Schuster. New York. Ilves, Toomas Hendrik. 1998. “Estonia’s Return to Europe.” Public lecture. http://vm.ee/en/news/estonias-return-europe Accessed 30 July 2017. Invest in Estonia. n.d. “Economy Overview.” https://investinestonia.com/business-in-estonia/estonian-economy/ Accessed 07 November 2017. Kallas, Märt Masso and Kristi Anniste. 2017. Eesti ühiskonna integratsiooni monitooring [The Integration Monitoring of Estonian Society]. Balti uuringute Instituut [in Estonian]. Kallas, Kristina, Ingi Mihkelsooand Kaarin Plaan. 2012. “Lõimuv Eesti 2000-2011. Integratsiooni monitooringute analüüs.” [Integrating Estonia 2000–2011. The Analysis of the Integration Monitorings]. Institute of Baltic Studies [in Estonian]. Kauppila, Laura Eleonora. 1999. The Baltic Puzzle: Russia’s Policy towards Estonia and Lativa 1992–1997. University of Helsinki. Kivirähk, Juhan. 2015. Avalik arvamus ja riigikaitse. [Public opinion and National defence]. Tellija: Kaitseministeerium. Turu-uuringute AS [in Estonian]. http://www.kaitseministeerium.ee/sites/default/files/elfinder/article_files/avalik_arvamus_ja_riigikaitse_marts_2015.pdf. Accessed 03 March 2016. Kõiv, Lea. 2000. “The Great Northern War. End of Swedish Rule in Estonia.” http://www.estonica.org/en/History/1558-1710_Estonia_under_Swedish_rule/The_Great_Northern_War_End_of_Swedish_rule_in_Estonia/ Accessed 07 November 2017. Laidre, Margus. 2001. “Reformatsioonist rahvusliku ärkamiseni. 1520–1850.” [From Reformation to the National Awakening. 1520–1850]. In Eesti identiteet ja iseseisvus [Estonian Identity and Independence]. Avita [In Estonian]. Laruelle, Marlene. 2015. “The ‘Russian World’: Russia’s Soft Power and Geopolitical Imagination.” Center on Global Interests. Turu-uuringute AS. 2017. “Avaliku arvamuse uuring LGBT teemadel.” The Survey of Public Opinion on LGBT Topic [in Estonian]. https://humanrights.ee/app/uploads/2017/05/Avaliku-arvamuse-uuring-LGBT-teemadel-2017-4.pdf. Accessed 28 August 2017. Miljan, Toivo. 2015. Historical Dictionary of Estonia. Rowman and Littlefield. Островский Е., Щедровицкий П. 1999. Россия: страна, которой не было // [Ostrovki, E. Shedrovitsky, P. Russia: the country that has not been.]. Вестник СМИ 9(41) с. 2-6 [in Russian]. Ponsard, Lionel. 2007. Russia, NATO, and Cooperative Security. Bridging the Gap. Routledge. Putin, Vladimir. 2001. “The speech on the Congress of Compatriots.” 11 October. http://en.kremlin.ru/events/president/transcripts/21359 Accessed 12 October 2016. Rannut, Mart. 2004. “Language Policy in Estonia.” Noves SL.. Revista de Sociolingüistica, Spring–Summer. http://www6.gencat.net/llengcat/noves/hm04primavera-estiu/docs/rannut.pdf. Accessed 28 August 2017. Raun, Toivo. 2001. Estonia and the Estonians. Updated Second Edition. Stanford University: Hoover Institution Press. 2016. “Путин: граница России нигде не заканчивается.” [Putin: the Border of Russia does not end anywhere]. RT [in Russian]. https://russian.rt.com/russia/news/335286-putin-grania-rossii Accessed 28 August 2017. Rudensky, Nikolai. 1994. “Russian Minorities in the Newly Independent States. An International Problem in the Domestic Context of Russia Today.” In National Identity and Ethnicity in Russia and the New States of Eurasia, edited by Roman Szporluk. M.E.Sharpe. Saarpoll OÜ. 2015. “Elust, Usust ja Usuelust.” ["On Life, Faith, and Faith Life”]. Saarpoll OÜ [i[in Estonian]http://www.saarpoll.ee/UserFiles/File/Elus,%20usust%20ja%20usuelust_2015_ESITLUS_FINAL.pdf. Accessed 01 December 2018. Schmidt, Royal J. 1956. “Cultural Nationalism in Herder.” Journal of the History of Ideas Vol. 17(3): 407–417. Transparency International. 2017. “Corruption Perceptions Index 2016.” https://www.transparency.org/news/feature/corruption_perceptions_index_2016 Accessed 07 November 2017. Tsygankov, Andrei P. 2006. Russia’s Foreign Policy. Change and Continuity in National Identity. Rowman and Littlefield Publishers, Inc.
Anna Tiido is an Estonian diplomat and researcher. She has a master’s degree in Sociology from Tallinn University, and one in International Politics from CERIS (Centre Européan de Recherches Internationales et Stratégiques) in Brussels. Her Ph.D. in International Relations is from the University of Warsaw. Her research is on the impact of the Russian minority issue on the relations between Estonia and Russia.